Green RV living might seem like a misnomer to some, but eco-conscious travelers know it’s entirely possible to help the planet while RVing. If you think putting the earth first is difficult when you’re driving a gas-guzzling box of stuff, think again. 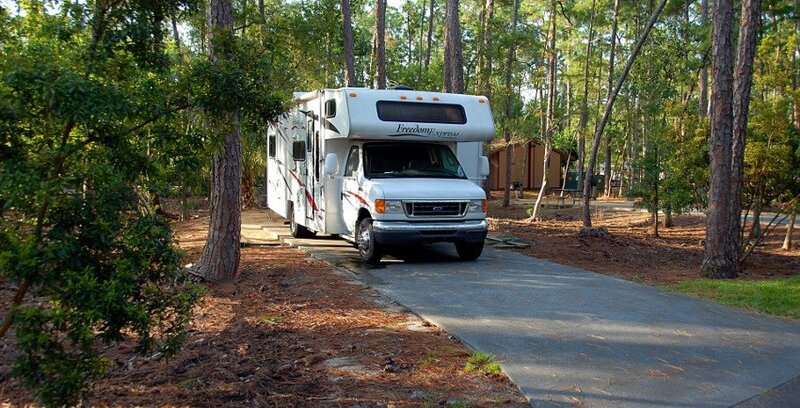 These surprisingly easy baby steps to green RV living will inspire you to give it a try. Yes, you can save the planet when you’re camping. You’ll be floored when you see how easy it is to be green on the road. Only one of these suggestions requires any kind of major investment. You can’t save the planet if you’re driving at speeds that burn more fuel than necessary. Driving slower isn’t just safe, it consumes less fuel. For instance, every five miles over the speed limit that you drive over 55 mph will cost you an additional $0.16 per gallon, according to the U.S. Department of Energy (DoE). “While each vehicle reaches its optimal fuel economy at a different speed (or range of speeds), gas mileage usually decreases rapidly at speeds above 50 mph,” the DoE says. This tip is so easy it’s ridiculous. Waterless products are a camper’s best friend and consume less resources. From the many dry shampoos available to waterless RV wash products, you’ll find many opportunities to conserve water in the city or when dry camping in the country. Unfortunately, RV campgrounds with recycling are rare. Recycling is just too cost-prohibitive in many small, scenic rural towns with great camping but no way to recycle items. But you can always find recycling somewhere. If you’re serious about making a difference for the planet, get a sturdy container to hang onto the most common recycled items—aluminum and #2 PET plastic bottles—and ditch them when you find a recycling bin. Barbecued RV meals eliminate the need to dirty up pots and pans, as well as your stove top. Slap a few hunks of beef or tofu on the grill, slip a few veggies into a barbecue basket, and you’ve got the fixin’s of a fantastic RV meal. You’ll use less water and avoid those dishpan hands. What could be better? RV fuel economy drops considerably when your holding tanks are full. Not only does excess liquid burn fuel but it also puts more wear-and-tear on your rig. If you know you can dump waste or resupply your freshwater tanks at your next location, don’t carry more liquid pounds than necessary. This is probably the hardest step for RVers to take and it’s definitely the most costly. But a waterless RV toilet cannot be ignored if you want to help the planet. The average flush toilet consumes more water than any other home appliance, according to the U.S. Environmental Protection Agency. RVers can do better by investing in a waterless RV toilet like Dry Flush, Incinolets, or another traditional composting toilet. These simple appliances consume far less water whether you’re dry camping in the desert or hooked up to utilities in the city. See also: Is RVing Green? Interesting. We already try to drive more slowly (below speed limits) partly because it feels safer with the trailer back there…and it does save on gasoline though that’s been more of a financial consideration than a green one. Nice to know it’s accomplishing two objectives. We also use a microwave and those bamboo/corn starch plates & utensils and we use those as firestarters for campfires (which aren’t very green, are they?-campfires, I mean). Question: what about sawdust toilets? We were involved in a long discussion last year about sawdust “toilets” (buckets, really) and wonder how green those are? How green compared to things like Depends and baby diapers, etc. Advice? The reality of waterless toilets is that their “water-saving” properties actually do very little to conserve water over a planetary scale. In fact, they require equipment and regular supplies that create extra expense and trouble. The bags, the coco coir, the rubber seals, the fans, the genie bags, etc, all represent not only extra expense, but an extra burden on the earth, which originates in third world countries and is transferred to local landfills. The manufacture of these supplies involves added water usage and water pollution, as well as slave labor and deforestation. We already have an effective sewer system that already separates the solids and transfers the sanitized liquids back into the water table. Though I have my suspicions as to the cleanliness of this transfer water, I believe the earth’s own filtration system can handle it if left alone. Regarding this filtration system, the “damage” that campers and poopers can do to it would not register a full percentage point against the damage that is done by mining, water bottling, and industrial agriculture, to name only three of hundreds. These corporations are the same ones into which the managers of your “retirement portfolios” invest your money to increase your retirement funds so you can go RV-ing as you wish. So “earth conscious” RVers out there think that if they save, by comparison, a tiny bit of water by going to a lot of trouble and expense to put their waste into the landfill instead, they are actually doing nothing, and possibly worse than nothing. A toilet flush is not really a waste of water; it is water put to good use. If you want to think about wasting water, think about the shower water that goes down the drain every day. Why not re-use that to flush the toilet? Or take more sponge baths? Or here’s a novel idea: Instead of spending thousands on a designer incinerator toilet, why not spend the money to convert your gray tank to reuse the shower water to flush the toilet? Also, try demanding that your wealth management agencies not invest your money in companies that poison water. The reduction in funds can’t possibly measure more than the cost of a top-of-th-line incinerating toilet. If you have a diaper genie toilet, or an incinerating toilet, or a composting toilet, and think you are “saving the earth”, you really have no laurels to rest upon. People have the misguided notion that water magically disappears from the planet with each use.. Flushing a toilet no matter where it happens, home or RV, does not remove any water from the planet. It is either filtered through a septic system or a treatment plants. On the latter, some evaporates and some after treatment is returned to the place from whence it came, only to go through the cycle again and again. Some indeed gets polluted beyond recovery, but not usually. My 2 cents, planet doesn’t need “saving “ it will survive fine, with us or without us. We are full timers and we purchased a waterless toilet “Laveo” and are very happy just how well it works. Home Depot had the best price when we purchased ours. As for going green every little bit helps but let’s not fool ourselves, every time someone purchases “something no matter what” there was some not so green things done to create the item. As for the barbecue, definitely go for the tofu and veggies and stay away from the cow flesh. There are few things more environmentally damaging than animal agriculture.